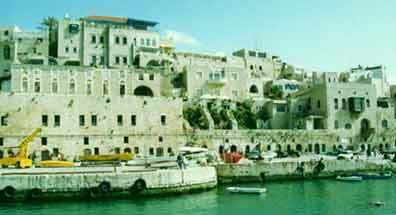 Jaffa (יָפוֹ) is an ancient port city in the central sector of the Israeli coast. The meaning of the name Jaffa (Yaffo) is lovely or pretty. The ancient city was built on a hill jutting out slightly from the coastline on the west and overlooking the open sea. At the foot of the rise on the western side extends the port, which was protected by a chain of rocks jutting out above the water; on the northern side there is a small bay that is protected from the southwest winds but open to the stormy winds from the north. Storms were probably overcome by using the mouth of the Yarkon River ( Me-Jarkon, Josh. 19:46) at a distance of 3.7 mi. (6 km.) from the northern corner, where boats took shelter in the winter. Jonah the prophet, unwilling to fulfill his mission to Nineveh, boarded a ship at Jaffa bound for Tarshish (Jonah 1:3). Some scholars assume that the expression the Jaffa sea, mentioned in the Bible in connection with the transport of the cedars of Lebanon to the Temple (II Chron. 2:15; Ezra 3:7) and in Josephus in connection with the defense line built by Alexander Yannai from the mountainside above Antipatris to the coast at Jaffa sea (Wars 1:99), is a reference to the jetties of the Yarkon at Tell Kadadi and Tell Qasīle. Archaeological excavations were conducted at the Jaffa tell from 1955 by Y. Kaplan on behalf of the Tel Aviv-Jaffa Antiquities Museum. Archeological discoveries have shown remains from a Canaanite city, a Jewish city built at the time of Ezra and Nehemiah, a third century BCE wall, a statue of Aphrodite, Hasmonean ruins, and traces of Roman occupation. Many myths and tales exist regarding Jaffa. According to Greek legend, it was to one of the rocks on the shore of Jaffa that the god of the sea, Poseidan, chained Andromeda, who was to have been eaten by a sea monster, but instead was rescued by Perseus. According to the Bible, it was from Jaffa that Jonah set sail, before his encounter with the whale, and in Jaffa where Saint Peter raised Tabitha from the dead. One Jewish legend says that all the sunken treasure in the world flows toward Jaffa, and in King Solomon’s time the sea offered great riches, which accounted for some of the king’s wealth. According to the legend, since Solomon's time, the wealth has once again been accumulating, to be distributed by the Messiah to each man according to his merits. Jaffa is claimed to be the oldest port in the world and was founded by Japheth, the son of biblical Noah. The oldest remains found are pieces of wall of sun-dried clay bricks in the eastern part of the ancient Jaffa fortress and dated from the 16th century BCE. Remains were also found from the 15th to the 13th centuries BCE, which was the period of Egyptian rule in Jaffa. Early Egyptian records show that it was conquered by Thutmose III in 1469 BCE. A folktale that came into being about 200 years afterward describes the conquest of Jaffa by Thutmosis' military chief by cunning, rather than by war, through introducing soldiers into the fort in baskets. In the El-Amarna letters, Jaffa is mentioned as an Egyptian district in which the king’s stores were located. In the Anastasi Papyrus I, from the time of Ramses II (13th century BCE), the Egyptian fort is described as being located on the side of the Canaanite city and containing workshops and arms stores. Excavations uncovered three stones of the fortress gate from the 13th century with inscriptions of the five titles of Ramses II. The remains of the fortress gate (fourth level in the excavations) belong to the period of Israelite settlement, in the second half of the 13th century, and near the threshold a bronze bar that supported the corner of the left gate was uncovered. The Dan tribe settled briefly in Jaffa shortly after the Israelite conquest of Canaan. There are no written documents from this period; the description of the border of the tribe of Dan, which ran over against Jaffa (Josh. 19:46) is now dated by most scholars to the Davidic period. The appearance of the Sea Peoples at the beginning of the 12th century BCE. left its mark in the signs of destruction at the fourth level of settlement and in the few Philistine remains. However, there is basis for the supposition that the connection between the Greek legend of Perseus and Andromeda and the rocks off Jaffa is rooted in this period. It appears that Jaffa remained outside the boundary of Israelite settlement. Excavations have uncovered a part of the fortifications from the ninth century comprising a glacis covered with slabs of stone, beneath which were alternate strata of pressed earth and sun-dried clay bricks whose general width in some place reached four to five meters. Later, conquered by King David, cedar trees from Jaffa were used in the building of King Solomon's original Temple in Jerusalem around 950 BCE. In the last third of the eighth century BCE., the period of the Assyrian invasions of Ereẓ Israel, Jaffa became, from what can be seen, part of the province of Ashdod. At the end of the eighth century it was under the protection of Ashkelon, according to Sennacherib, king of Assyria, who conquered it together with Bene-Berak and Bet Dagon on his way to fight Hezekiah, king of Judah, and his Egyptian allies. In the fifth century BCE the coastal cities were held by Tyre and Sidon with the support of the Persian rulers. Jaffa was under the control of Sidon according to the description of the coastal cities of Syria and Ereẓ Israel of Pseudo-Scylax (fourth century BCE) and the inscription of Eshmunezer, king of Sidon, which relates that the lord of kings (the king of Persia) gave Sidon two cities on the Ereẓ Israel coast – Jaffa and Dor – as a sign of his gratitude. A Sidonian stone dedicatory inscription was discovered in 1892 in Jaffa and mentions the establishment of a Sidonian temple in the city. To these should be added the discovery of a part of the wall of the Sidonian fortress uncovered in excavations in Jaffa in 1955. Following the Babylonian exile in the sixth century BCE, Jaffa came under the control of the Phoenecians and then the Greeks. After the Macedonian conquest and the death of Alexander the Great, Jaffa passed from one military commander to another until finally, in about 301 BCE, it fell, together with the rest of the country, to the Ptolemaic governors of Egypt. Jaffa quickly became a Greek city and its name changed to Ioppe ( Ἰόππη), which is a Greek-sounding name. From the period of the Ptolemaic dynasty, which lasted a few hundred years, it is known that coins were minted in Jaffa during the reign of Ptolemy II and III bearing the name Ioppe. Another source of information on Jaffa in this period is the Zeno Papyri (mid-third century BCE). In the excavations of Jaffa in 1961, a cave of tombs built of hewn-out stones and part of a dedicatory inscription in Greek that mentions the name of Ptolemy Philopater (the IV), from the end of the third century BCE, were found. At the beginning of the second century BCE Ereẓ Israel, and Jaffa together with it, was conquered by Antiochus III of the Seleucid dynasty. With Pompey's conquest of Ereẓ Israel (66 B.C.E. ), Jaffa was separated from the Jewish state and became, as did the other coastal cities, a free city in the district given over to the authority of the Syrian commissioner. Only in 47 A.D. did Julius Caesar return the city to Judea (Jos., Ant., 14:202, 205). In 38 A.D., Herod captured Jaffa on his way to Jerusalem to establish his reign there. Afterward he built the harbor of Caesarea, which was a strong competitor to Jaffa. During the reign of Antony in the east, Jaffa, together with the other coastal cities, was given to Cleopatra, the queen of Egypt; only in the year 30 A.D. was it returned to Herod by Augustus Caesar. A part of a house that was uncovered in the excavations belongs to the Augustan period. The structure included an entrance yard, a water hole, and a wall that was part of a room with an entrance. Jaffa is mentioned in the Christian chronicles in the context of the stories of Tabitha (Dorcas) and Simon the tanner. The New Testament contains the story of the miracle of Tabitha, who was resurrected by Peter (Acts 9:36–42). While in Jaffa, Peter stayed in the house of Simon the tanner and on his roof dreamed the dream that has been interpreted to allow Christians to eat the flesh of unclean animals. It was also there that he heard the voice calling him to convert pagans, as well as Jews, to Christianity (Acts 10:9ff.). With the outbreak of war with the Romans, Cestius Gallus destroyed Jaffa, but the city was quickly rebuilt by the Jews. They stationed a fleet of ships in the sea that attacked the ships passing on the maritime route from Egypt to Syria. Prior to his arrival in Jerusalem, Vespasian sent foot soldiers and cavalry to Jaffa, under cover of darkness, and they surprised the defenders of the city. The startled inhabitants quickly fled the city to take shelter in the boats, but, to add to the tragedy, a stormy wind broke early in the morning and dashed the boats and those in them against the rocks of the shore. The survivors were massacred by the Romans, who were waiting on the shore (Jos., Wars, 3:414–431). Vespasian then destroyed the city and built a fort on its ruins that contained a guard from the Tenth Legion. In the excavations, a piece of a tile was discovered with the seal of the Tenth Roman Legion on it. Jaffa was rebuilt, it appears, still during the reign of Vespasian, who turned it into an autonomous city by the name of Flavia Ioppe. This is known from the coins that were minted during the reign of Heliogabalus (218–222), on which this name is mentioned. Three identical inscriptions engraved on a stone uncovered during the excavations tell of the Jewish community in Jaffa during the period between the destruction of the Second Temple and the Bar Kokhba revolt. The inscriptions contain the name Yehudah, who was the inspector of weights and measures in the Jaffa market during the reign of Trajan. Another discovery is the floor of a cellar that belongs to the period of Trajan; above it were found many clay jars and bronze and silver coins. The Mishnah and Talmud, as well as tombstones discovered in the cemetery of Jaffa Jews in Abu-Kabir, are sources of information on Jewish Jaffa during the second to fourth centuries C.E. Among the scholars of Jaffa mentioned in the Talmud are R. Ada (Meg. 16b; Ta'an. 16b), R. Naḥman (Lev. R. 6:5), R. Yudan (Lev. R. 20:10), and others. From the tombstones it is possible to learn of the occupations and origins of the dead. It becomes clear that the Jews of Jaffa during this period lived in neighborhoods according to their country of origin. Jews from Alexandria, Cyrenaica, Cappadocia, and other places are mentioned on the stones. Among the professions were trades in cloth, perfumes, rags, fishing, etc. Jerome, who visited Jaffa in 382, expressed his surprise at the sight of the harbor of fleeing Jonah ; he also tells that he saw the rock on which Andromeda was bound. From this period until the Arab conquest, the information about Jaffa becomes more scarce. Cyril the Holy, from Alexandria, who wrote during the first half of the fifth century, described Jaffa as an important commercial center and a port of exit for all travelers from Judea to the countries of the Mediterranean. During this period, it seems that after its Christian population grew, Jaffa became the seat of the episcopate, and thus the name of the bishop of Jaffa, Phidus, is mentioned in the list of the church council that was convened in 431 in Ephesus. The name of another bishop, Elias, who participated in the council that convened in Jerusalem in 536, is also mentioned. In 636, Jaffa fell to the Muslims. While Ramleh flourished as the capital of the Palestine region, the importance of the port of Jaffa increased; it took over trade from Caesarea. Jaffa served as a storage center for merchant shipping and as the port of entry for Christian and Jewish pilgrims. Ahmad ibn Ṭūlūn, the ruler of Egypt and Palestine, fortified Jaffa in 878. However, its security and trade were endangered from time to time by riots and anarchy. In 1050, Ibn Baṭlān, an Arab geographer, wrote of the town [Jaffa is] a town of starvation. There is not even a teacher for small children in it. In the early tenth century, R. Joseph, the father of Saadiah Gaon, died there. A Hebrew letter dated 1071, which was found in the Cairo Genizah, reports the confiscation of merchandise in the port of Jaffa. A bill of divorce (get) written in Jaffa in 1077 proves that it had a rabbinical court at the period. Jaffa was conquered by the Crusaders in the summer of 1099, prior to their conquest of Jerusalem. Genoese ships, which anchored in Jaffa harbor, brought supplies to the besiegers of Jerusalem. Jaffa also served as a base and starting point for the Crusader conquest of other coastal towns as far north as Beirut. In 1102, twenty pilgrim ships carrying Crusaders sank in the harbor during a storm. Thus, to go to Jaffa in German acquired the connotation of to go to Hell. In the 12th century, during the first four Crusades, Jaffa was the main gateway to Jerusalem. It was the capital of the feudal kingdom of Jerusalem, which, from 1157, on included Ashkelon and its surroundings. The county of Jaffa had the right to mint its own coinage. The inhabitants were a mixture of European and Oriental Christians, who mingled within a French-speaking Palestinian nation. In 1170, Benjamin of Tudela reported that he found only one Jew in the town. Richard the Lion-Hearted built a citadel that was destroyed in 1196 by Saladin's brother, Ayyubid ruler al-Malik al-Adil, who conquered and destroyed Jaffa, slaughtering 20,000 Christians in the process. In the 13th century – during the latter half of the Crusades period – Jaffa failed to retain the importance it had in the preceding period; trade and shipping moved to Acre. Nonetheless, its strategic importance remained, as is evident from the fact that both Frederick II, the Holy Roman Emperor, who led the Sixth Crusade (1228), and King Louis IX of France, who led the Seventh Crusade (1248), fortified the town. During this second period, the Crusaders acted with tolerance toward the Jews. The small Jewish community in Jaffa was comprised of craftsmen, potters, and glaziers (many of whom went to Europe). Their influence is noticeable in the contemporary pottery of southern France. Jaffa passed into the hands of the Khuwarizm conquerors in 1244 and to the Mongols in 1260; in 1268 it was finally conquered by the Mamluk sultan Baybars, who razed it to the ground and massacred its population. At the beginning of the Mamluk period Jaffa was rebuilt and its port resumed operations, but in the mid-14th century, when European crusaders renewed their plans and attempts at conquest, the Mamluks destroyed the port of Jaffa and the ports of other coastal towns in order to prevent invasion by Christian warships. Jaffa was abandoned, except for occasional visits by merchant ships and pilgrims. The guards who watched over the ruins of the town would light beacons in order to warn Ramleh of the approach of a ship, but until permission to disembark was given by the authorities in Ramleh, Gaza, or even Cairo, pilgrims had to wait for many days on board ship, and afterward in the dark and stinking cellars of the ruins, humiliated by blows and extortion. Many died on board ship, in Jaffa, and on the way to Jerusalem. For Jews immigration via Jaffa was even more dangerous, especially in the 15th century, as a result of the decrees issued by the pope and the Venetian Republic against carrying Jews to the Holy Land. Only when the decree was revoked in 1488 did Jews openly arrive in Ereẓ Israel via Jaffa. From the beginning of the 16th century until the mid-17th century, there was no change in the status of Jaffa. In the mid-17th century the Turks added a tower to the two existing towers, and increased the watch over the town. In 1641, the Franciscan friars, who looked after Catholic pilgrims, set up a small monastery with a church. Inhabitants and merchants of Ramleh began to gather in the town. At first, tents and booths were set up in Jaffa, but only at the end of the century were houses built there. The import and export trade gradually increased. In the early 18th century Jaffa was the manufacturing and export center of the Jaffa soap industry, and apparently, the first oranges in Palestine were grown in Jaffa. A quay was added to the port for the disembarkation of passengers, and hostelries and houses for trading agents and European consuls were built. Individual Jews were attracted to the town. In 1769, Jaffa was destroyed by Uthman Pasha, the governor of Damascus, because its inhabitants refused to be compelled into providing money for quelling the revolt of Zahir al-Amr the governor of Acre. In 1775, the town was besieged by Muhammad Bey Abu Dhahab of Egypt, who at first had assisted Zahir al-Amr but later fought for the sultan; he massacred many of Jaffa’s inhabitants, among them Jews. Abu Dhahab built a monument to his victory from decapitated heads, for which the site of the monument received the name Tell al-Ruus ( hill of the heads ). In 1799, Napoleon besieged the town and conquered it in a storm. According to some sources, Napoleon ordered 4,000 wounded soldiers to facilitate his withdrawal from the area. In the maze of streets the Armenian convent that served as a hospital for Napoleon’s troops is still present. Following Napoleon’s departure, the city was rebuilt by the local governor, Muhammad Abu Nabut. On his initiative, the well-planned markets of the town, as well as its central mosque (near the present-day Clocktower Square) and the water fountain on the road leading to Jerusalem (which bears his name), were built. The city wall, with its towers, and the inner citadel on top of Jaffa Hill by the sea were renewed. Hewn stones were shipped by sea from ruined ancient cities on the coast, mainly from Caesarea, for these structures. In November 1831, Jaffa was occupied by the army of Ibrahim Pasha, stepson of the Turkish governor of Egypt, Muḥammad ʿAlī, who rebelled against the central Turkish government. During Ibrahim Pasha's eight-year rule, Jaffa progressed due to the better security situation, the improvement in the status of non-Muslim residents, and the removal of obstacles in the way of pilgrims reaching the town's port on their way to Jerusalem. Immigrants from Egypt established agricultural settlements in the vicinity, where 50 years later citrus groves were planted and were later integrated in the boundaries of either Jaffa or Tel Aviv. After the country returned to Ottoman rule, Jaffa's growth continued slowly. Experiments in growing mulberry trees near the town to develop the silk industry were unsuccessful, but the port of Jaffa began to be visited by steamships and, beginning in the 1850s, was included in the regular shipping lines of companies from Marseilles, Trieste, and, later, Odessa. With the opening of the Suez Canal, it also came into the scope of oceangoing vessels. In about 1865, the pace of the town's and port's progress quickened: the city was connected to the telegraph network; the harbor jetty and other port installations were improved; and a lighthouse was built. The harbor entrance between the shore reefs was broadened, and a second gate was opened in the city wall. In the 1880s, these walls were entirely razed and new quarters were erected beyond Jaffa Hill. The construction of the road to Jerusalem and the wealth which came to the city with Jewish immigration and settlement; the expansion of Jerusalem; and the planting of citrus groves in the vicinity all enlivened the city's maritime commerce and contributed to its progress. Another factor was the railroad from Jaffa to Jerusalem, built in 1892, which served pilgrims and tourists. Whereas irrigated orchards could hardly be expanded before, because animal-driven well pumps could not reach deeper groundwater reserves, this became possible from 1898 onward, when small kerosene pumps were introduced. Changes took place in Jaffa's sea trade in the 50 years preceding World War I. Exports of grains and olive oil nearly ceased, but more sesame and sesame oil, watermelons, and particularly citrus fruit and soap were exported. Imports began to exceed exports in volume, as new products – petrol, building wood, cement, paints, caustic soda (as a raw material for soap production), European flour and machines – arrived. In 1852 a small group of Americans founded in Jaffa a small colony they called Mount Hope, which lasted until 1858. Another unsuccessful attempt at agricultural settlement was a model farm, which A. Isaacs, a Jewish convert to Christianity, sought to establish with the intention to do missionary work. A second attempt by Americans to settle near the city in 1866 was equally unsuccessful. In their stead came members of the German Templer community, who took over the Americans’ huts, later built their own quarter (Jaffa’s German Quarter ), and became an important factor in the city’s progress. They also established the agricultural colony Sarona (today the Tel Aviv Kiryah of government buildings) and another small urban quarter named Valhalla. All these colonies were abandoned when German males were detained by the British authorities at the beginning of World War II. Arabs, both from Palestine and the neighboring countries, particularly Egypt, settled in Jaffa throughout the 19th and beginning of the 20th century, causing the city's population to grow from 2,500 (at most) in the early 19th century to 5,000 in the 1850s and to nearly 40,000 (with suburbs such as Tel Aviv included) in 1914. In 1909, a group of Jews from Jaffa decided that they wanted to leave the narrow crowded streets of the town. They bought a stretch of sand dunes north of Jaffa and called it Ahuzat bayit, which became Tel Aviv. World War I brought numerous difficulties, as the port was closed, the railway to Lydda was dismantled, the town was kept under a blackout, and military objects underwent shelling. Nearly all the Jews were expelled from Tel Aviv and Jaffa by the Turks during World War I, but they returned after the British conquest. Economic life was paralyzed, and citizens were mobilized for the Turkish army. These events were followed by hunger, and a considerable part of the inhabitants abandoned the city. On Nov. 16, 1917, Jaffa was occupied by the British and for one month found itself in the front line, until the Allied armies crossed the Yarkon River and advanced north. Under the British Mandate, Jaffa recovered, expanded, and developed. Arab riots in 1921 spurred Tel Aviv's growth, and it became a separate municipality under Meir Dizengoff. More riots in 1929 caused additional Jews to leave Jaffa for the safety of Tel Aviv. Soon Jaffa became a small village in comparison to the rapidly developing Tel Aviv area, which received city status in 1934. In 1950, Jaffa and Tel Aviv were officially combined into one city. Excluding Tel Aviv, Jaffa’s population numbered 32,524 in 1922 and 55,346 in 1931. Modern industry became an important foundation of Jaffa’s economy, with many enterprises established by Jews and by the German Wagner, while traditional branches (olive-oil presses, soap factories) declined. Another important economic asset was the port, where modern installations, e.g., a boat anchorage protected by a breakwater dam, extended quays, and an area for wharfs and services were added in 1934–35. The construction of Haifa port at that time did not reduce the trade of Jaffa port, where export of citrus fruit was of great importance. The Arab riots that spread from Jaffa on April 19, 1936, and the general strike proclaimed by the Arab Higher Committee, however, paralyzed the port. When Tel Aviv's port was opened soon afterward, the port of Jaffa no longer maintained its former standing; it was closed for security reasons during World War II and could hardly recover in the years 1946–47. By this time, the city population was nearly 100,000; 70,000 were non-Jews, making Jaffa the largest Arab city in the country. Many workers were Arab immigrants coming from near and far who settled in villages of the vicinity, particularly in Salameh. The riots that broke out immediately after the UN decision to partition Palestine (Nov. 29, 1947) and soon developed into full-scale war brought large units of volunteers from other Arab countries to Jaffa. They established themselves as the rulers of the city and caused much suffering to its inhabitants. In the first stages of the war, the British authorities protected the city and prevented Jewish forces from occupying parts of it. On May 13, 1948, the city fell to Jewish forces, and most of its inhabitants abandoned it by sea. Large numbers of Jewish immigrants were housed in considerable parts of Jaffa, and on Oct. 4, 1949, the government of Israel decided to amalgamate Tel Aviv with Jaffa, which one year later were given the name Tel Aviv-Jaffa. After North African Jews had settled in the town, the Jewish community slowly grew to number about 400 members in 1856. The Jerusalem sages gave Rabbi Judah Levy from Dubrovnik (Ragusa) the task of receiving Jewish pilgrims in Jaffa port and of aiding them on their way to Jerusalem. First beginnings in agriculture were the citrus grove of Moses Montefiore and the agricultural school of Mikveh Israel, which entertained close ties with the Jaffa community. The size of the community increased considerably with these enterprises and, during the period of the First and Second Aliyah, Jaffa became the center of the new yishuv. Together with the opening of industrial enterprises came the creation of the organizational framework of the community, which comprised both Ashkenazim and Sephardim. Health and cultural institutions were established: e.g., the Sha'arei Zion Hospital, schools of the Alliance Israélite Universelle, and of Hovevei Zion and the Herzlia Secondary School. In 1908, the Palestine office of the Zionist organization was opened in Jaffa under Arthur Ruppin. The wholly Jewish quarters that came into being, like Neveh Zedek, Neveh Shalom, etc., later became part of Tel Aviv. In 1905, there were 4,765 Jews in Jaffa and, in 1914, their number was estimated at 15,000. After World War I more Jewish suburbs were established within its municipal boundaries, with approximately 30,000 inhabitants in 1947. These quarters theoretically belonged to Jaffa and paid taxes to its municipality, but received all services (health, education, security) from Tel Aviv, where most of their breadwinners found employment. The inner parts of Jaffa, however, were gradually deserted by Jews, following the riots of 1921, 1929, and 1936–39, and were entirely abandoned at the end of 1947. Only after the State of Israel was founded did Jewish immigrants again settle in Jaffa. Reconstructed and renovated, Old Jaffa's cobblestone paths and winding alleys twist through the massive stone fortifications that surround the city. Old Jaffa was transformed from a slum into an artists quarters complete with galleries, cafes, and shops; yet, few artists can really afford to live in the area. Visitors can follow the walls that snake around the bottom of the city for a look at how this ancient, area is alive with some of the area's best seafood restaurants and nightclubs. The art galleries and high-quality folk craft shops sell fabrics, ceramics, metal works, jewlery and clothes. One of the few religious sites is the house of Simon the Tanner, where, according to the Gospels, Peter first realized the gospel message had to be extended beyond the confines of Judaism. You can walk to Jaffa from Tel Aviv, but it’s a good forty minutes (depending on where you start your journey). The easiest spot to locate in Jaffa is Hagana Square where the clock tower stands, built in 1906 by the Turkish Sultan, Abdul Hamid II, to commemorate his 30th anniversary as ruler. If you head toward the minaret towering over the Mahmoudiya Mosque, you'll find yourself in a Middle Eastern buffet, with cafes and kiosks selling all of the region's delicacies. The Visitors' Center in Kedumim Square has exhibits of archaeological remains and the history of Jaffa. The square is a good place to sit and have a picnic and people watch. At night, bands often play here. The streets off the square are lined with shops, nightclubs and cafes. Sources: Joseph Braslavi (Braslavski) and Shlomo Aronson, Encyclopaedia Judaica. © 2008 The Gale Group. All Rights Reserved.